Alta Mare by Andronis, located in the heart of Oia, evokes the peaceful surroundings of Santorini with stylish accommodations across five exceptional suite categories. The well-appointed cliffside accommodations boast private terraces, outdoor Jacuzzis and captivating views overlooking the famed caldera and deep blue Aegean Sea. 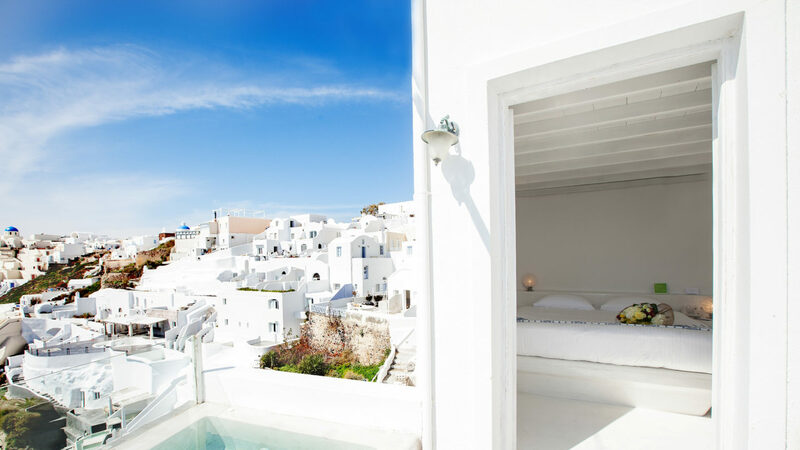 Drawing inspiration from its serene surroundings, each suite is designed in a crisp Cycladic white with warm neutral tones and luxurious touches. The Concierge is exceptional and well-connected to arrange any desire from private helicopter rides to indulging in rejuvenating spa treatments at the Mare Sanus Spa or reserving a table at Lycabettus, known as one of the most beautiful outdoor dining venues set on a peninsular cliff to witness the breathtaking sunset. Guests can also savor an elegant dinner at Lauda boasting a spectacular sea view backdrop. The Andronis Boutique located steps away from your suite carries the latest eclectic Greek designers from Etho Maria to Mary Katrantzou ranging from casual summer attire to elegant evening ensembles. For those looking to explore, the town of Oia is steps away and guests can discover local spots while immersing in Greek culture and genuine hospitality. Alta Mare by Andronis boasts lavish suites across five categories where each one offers an unique experience. Each offers spectacular views overlooking the sparkling deep blue Aegean Sea, the volcano and caldera plus taking in the calming breeze. The Retreat Suite, an open-plan cave suite, is the ideal romantic hideaway while the Exclusive Suite with a Cave Jacuzzi offers exclusive touches that will make your stay unforgettable. Please note that children under 13 years old are not permitted due its cliff-side location. Located in Oia, Alta Mare by Andronis is a 20-minute ride away from the Santorini Airport or 30-minute ride away from the Athinios port. It is adjacently situated to Andronis Boutique and Andronis Luxury Suites.